**PLEASE NOTE: Only those who received an email confirmation with details have a spot on the field trip. 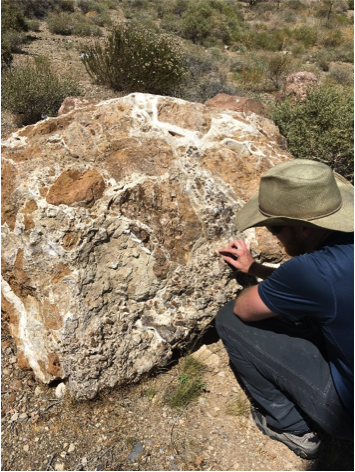 This year’s GeoSymposium field trip, hosted by the UNLV SEG Student Chapter, will feature a tour of the open pit mine at the Mountain Pass carbonatite given by mine staff of the current operator, MP Minerals. Carbonatites are igneous rocks containing more than 50% carbonate minerals and can host economic grades of rare earth elements (REEs), uranium, thorium, yttrium, and zinc. The Mountain Pass carbonatite contains 8-12% REE oxides, mostly hosted in bastnӓsite, and has been mined on and off since the 1950s. Participants will be required to wear long pants and close-toed shoes, along with high-visibility vests provided by the department and hard hats provided on-site.